The Franciscan Monastery of the Holy Land in America is the home of a worldwide Commissariat of Friars Minor and monasteries who function as bridges between the Holy Land and Christians all over the world. The Commissariat offices here at the Monastery in Washington, D.C. coordinate the vital support for the work of the Franciscans who work in the Holy Land. IN MEMORIAM: FR. JIM CLEARY, O.F.M. Cap. He was an alumnus of St. Francis High School Class of '55 and St. Maryâ€™s College in Moraga. He served in the U.S. Army from 1961-1963. He then received a Master of Divinity from the Graduate Theological Union in Berkeley, CA in 1970. After his ordination Fr. James was sent to Our Lady of Angels Church in Hermiston, OR to serve as associate pastor. He was a teacher at St. Francis High School in La Cañada-Flintridge, CA. He was Pastor at St. Lawrence of Brindisi Church in Los Angeles, CA. He was elected definitor 1979-1982. He was Guardian of San Buenaventura Friary in San Francisco, CA. He was Vicar at San Lorenzo Friary in Santa Ynez, CA. He was Pastor at Old Mission Santa Ines in Solvang, CA. He was Director of Postulants at San Buenaventura Friary in San Francisco. Afterwards he served as a chaplain at St. Francis Medical Center in Los Angeles, CA. He retired at St. Lawrence of Brindisi Church in Los Angeles and then received care at St. John of God Care Center in Los Angeles and then at Mercy Care Center in Oakland. He died of heart failure at Alta Bates Summit Hospital in Oakland, CA on January 15, 2019. Pope Francis has accepted the resignation from the pastoral governance of Medan, Indonesia presented by Most Rev. Anicetus Bongsu Sinaga, OFM Cap., and appointed as metropolitan archbishop Br. Kornelius Sipayung, OFMCap, until now Provincial Minister of Medan. Br. Kornelius Sipayung, OFM Cap. was born on August 26, 1970 in Bandar Hinalang-Kabanjahe, North Sumatra, in the Archdiocese of Medan. After attending the Christus Sacerdos minor seminary in Pematangsiantar, he studied philosophy and theology at the St. John school there. He professed perpetual vows on August 22, 1998 and was ordained priest on December 11, 1999. From 1999 to 2002, Br. Kornelius was pastor of Our Lady of the Assumption in Kabanjahe, Medan. From 2002 to 2005 he studied for the licentiate in dogmatic theology at the Gregorian University in Rome, during which time he also studied English in Brisbane, Australia. For the next ten years Br. Kornelius served as formator of Capuchin seminarians in Pamatangsiantar and taught various disciplines at the St. John school there. From 2012 to 2015 he served as guardian at Pamatangsiantar and Vice Provincial Minister of Medan. Since 2015 he has served as Provincial Minister, having been reelected for the 2018 to 2021 triennium. Br. Kornelius was also a member of the collaborating group of Indonesian Capuchins, which brought together the two Provinces of Medan and Pontianak, as well as the Custodies of Sibolga and Nias. He was also part of the Pacific-Asia Capuchin Conference (PACC). At the national level, Br. Kornelius is a member of the theological commission of the bishops' conference. At the diocesan level, he is a member of the presbyteral council and serves as an administrator for the Harapan Jaya Foundation and Catholic Charities. ROME - When storm clouds gather and the Catholic Church is tossed by the scandalous behavior of some of its members, Catholics must repeat what St. Francis of Assisi repeated: "God is and that suffices," the preacher of the papal household told Pope Francis and his aides. "Let us also learn to repeat these simple words to ourselves when, in the Church or in our lives, we find ourselves in circumstances similar to those of (St.) Francis, and many clouds will disperse," said Capuchin Father Raniero Cantalamessa on Dec. 7. The preacher of the papal household leads the pope and Roman Curia officials in a spiritual reflection on most Fridays of Advent and Lent. For his 2018 Advent reflections, Cantalamessa said he would "set aside every other theme and any reference to current problems" and focus on each individual's need for a personal relationship with God. "We know from experience that an authentic personal relationship with God is the first requirement in dealing with all the situations and problems that come up without us losing our peace and patience," said the 84-year-old Cantalamessa. At the suggestion of Pope Francis, Cantalamessa will lead a retreat for the bishops of the United States Jan. 2-8 at Mundelein Seminary near Chicago as they continue to discuss and discern ways to handle the clerical sexual abuse crisis. For the theme of his Advent reflections at the Vatican, the Capuchin chose a verse from Psalm 42: "My soul thirsts for God, for the living God." "People today are passionate in searching for signs of the existence of intelligent beings on other planets," which is "legitimate and understandable," he told the pope and Curia officials. "Few, however, search for and study the signs of the Living Being who has created the universe, who entered into its history, and who lives in it." Yet while "we have the real Living One in our midst," he said, "we overlook him to search for hypothetical beings who, in the best of cases, could do very little for us and certainly could not save us from death." A fundamental fact for those who believe in God is not only that he exists, Cantalamessa said, but that he lives and continually seeks a relationship with the human beings he created. Many Christians see Jesus' remark "Seek, and you will find; knock, and it will be opened to you" as a promise that Jesus will give them everything they ask for, and then are "perplexed because we see this rarely happens," he said. But the basic promise is "Seek me and you will find me; knock and I will open the door," Cantalamessa said. "He promises to give himself, above and beyond the small things we ask of him, and this promise is always infallibly kept. Whoever seeks him finds him; he will open to whoever knocks, and once someone has found him, everything else is secondary." According to a Franciscan scholar, he said, St. Francis was comforted and went around repeating to himself, "God is and that suffices! God is and that suffices!" Cindy Wooden Catholic News Services, Dec. 7, 2018. We cultivate a disposition of humility and respect of the dignity of others. Gentlemen, do you wonder what it's like to serve God as a Capuchin Franciscan? 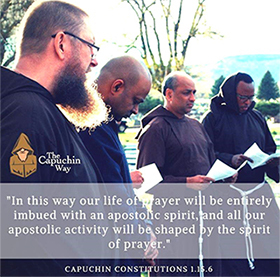 The Western Province offers several "Come & See" weekends throughout the year, offering single Catholic men a chance to discern a possible Capuchin vocation. A vocation retreat is a great opportunity to meet Capuchin Franciscan priests and brothers, talk to some of our students in formation and see first hand what our life is like.